16163.E212 Charles Henry 9 Bigelow, son of Edwin Eugene 8 ( Dexter E. 7 , Moses Foster 6, John 5, John 4, Joshua 3, Joshua 2, John 1) BIGELOW, and Elizabeth (COUNTRYMAN) BIGELOW, was born 15 June 1871 in Slocumville, St. Lawrence co, NY. He married on 08 July 1893 Deborah Irene Bresett (Bressette?) in DePeyster, St. Lawrence co, NY. She was born in 1892 and died in 1943. 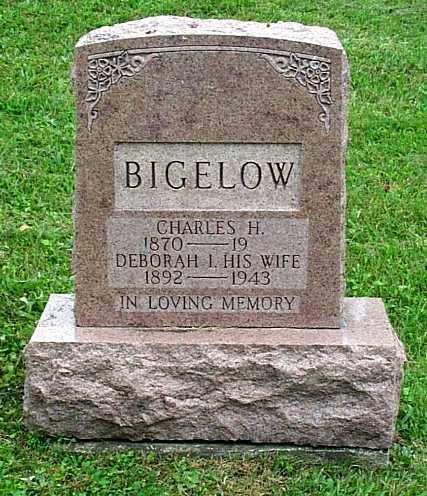 He married second Stella May Mcintyre in DePeyster, St. Lawrence co, NY. Charles died 28 November 1950 in Gouverneur, St. Lawrence co, NY.